The sewing enthusiasts among us will enjoy this fun and delicate tangle pattern. Eyehook was created by Port St. Lucie, Florida, CZT® Debbie Perdue, “inspired by the hook and eyes in my sewing kit. Not that I am doing much sewing lately as my ‘need to tangle’ is all consuming.” Debbie recently contributed Drip-Drop to our tangle collection. Eyehook is easy to draw and as Debbie shows us below it has a lot of potential for embellishment. At first I turned my tile 180° for each eye, but then realized that drawing them “sideways” was a simpler way to go. 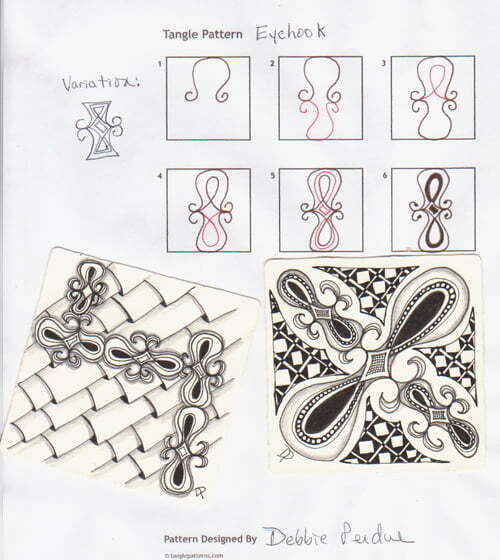 Here are Debbie’s step-by-step instructions for drawing her tangle and two beautiful Zentangles showing ways to use Eyehook. Thanks for the heads up on the mystery books. I don’t have a Kindle, but I use the Kindle app for my iPhone. I love the tangle, and I’m very interested in the tangle that is the foundation for the left-hand tile…which kind of looks like roof tiles. Is there a name for it? Directions for it? Eye hook looks like lots of fun! Thanks. I’m looking forward to working it into one of my tangles. Very classy tangle! I’ll be doing this one for sure!! LOVE! this tangle. Also, love the foundation tangle and wonder what is the name and is ther a tutorial? Thanks for sharing. This is an absolutely BRILLIANT tangle! What a great idea/inspiration, using a hook/eye! LOVE it! I really like your variation of it too, Linda, up in the corner – simple but beautiful!